So while removing all the cardboard stuff from my cases in preparation I noticed a few things. 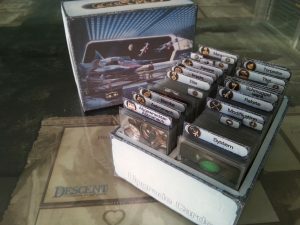 All my cool little boxes I hand made to store the ship tokens in are now obsolete since the pilots that come with the ships are different. Not that big a problem for me since I ended up not really liking them for actual ease of use. My Rebel and Imperial storage containers are much more open now that there is no first order or resistance in them. Of course I'll need new containers for them. I have no idea where the binder of cards went? It is just gone. I have the Legion binder and the Armada cards are all in a card box. But no X-Wing. If you built the same microhanger / gear box thing I did, note that the new dials are wider than the 1.0 ones, so you really can't use the gearboxes anyways. I could still use the little ship hangers but the ships were never the storage issue so eh. I'm just a normal scrub with deep Plano containers. How do y’all store your cards? ED: Showed foamboard version, which is what I use. ED2: Of course, with the new upgrade card sizes, that'll have to change. Honestly I use binders. Yeah, there's a lot of flipping, but because of the size of the upgrade cards it was generally easy to have an entire ship type or upgrade type on 1-2 sheets. This will obviously change with the new version. Stacked in one row of the plano boxes I have for everything. Come 2.0 I'm just going to use standard card boxes. I went with binders for cards as well. No ragerts. Torn into tiny pieces and baked into a cake that was then consumed entirely by me. The cards are part of me, and I am part of the cards. I'm one with the cards, the cards are with me. Just print it out, make a new cake, consume the new cake. I saw 20 unread post and became excited thinking we might have a new ship revealed. I hate you all and hope you all throw blank dice. That gets you the new rules. You still need to get rid of the old ones. The ones that are ... part ... of you. ...I hate you all and hope you all throw blank dice. My X-Wing cards are in a binder. My Armada cards are in one of those sirwillis boxes. It works for Armada because there are not as many cards. With X-Wing I have so many it is easier to look at them in binder pages. However I almost never use my cards since I play entirely casual with one other person and we have just used printed out list from an online builder. I assume by eating them like see317? I have to go into that box and pull out the bombs, shields, and evades since those are not included in the conversion kits and there aren't enough of the new ones in the core. Cardboard is an important part of a high fiber diet. Miniature Market has a bunch in stock still. If you’re looking for a few in particular I’d be happy to scope out a few FLGS in Raleigh and Fed Ex ‘em to you. But he's looking at first order stuff like the special forces tie which isn't in any of the 2.0 conversion kits, right? Because now it's a separate faction? So if I get more 1.0 stuff now, I'll need additional conversion kits instead of just waiting for the 2.0 release. Ah gotcha. Yeah I think that's the case. If I had to take a shot in the dark my assumption would be a new core set and wave next year in either May or September to coincide with marketing for Episode IX. Finally got to play again tonight. Had the most frustrating dice, but in the end they came through. Rolled 10 dice over 3 attacks one turn, needed 1 hit to kill. No hits. Next turn rolled 9 dice over 3 attacks, same ship, no hits. Many, many turns later, rolled hits on every die that turn (7 I think over 3 attacks at range three) and did 3 damage to kill one and 1 damage to kill the last ship. I think I had better performance hitting at range 3 than range 1 that game. My order shipped yesterday. It will arrive tomorrow! Mother nature confirmed Imperial player, fan of TIE punishers? I plan on at least sleeving the damage deck and just keeping it in my plano, but not sure what to do with my pilot and upgrade cards. Do we know what size sleeves the conversion kits are going to need? My preorder doesn't ship until tomorrow. I'm just using my binder pages for upgrade cards then pulling them out when needed. I probably won't individually sleeve them but I will the damage deck as that gets used way more. I think all the cards are now the standard american. No mini ones. So whatever the 1.0 pilot cards were. I also ordered 400 hyper matte sleeves. May just use deck boxes for now. No news on my conversion kits yet, but I don't mind waiting a little bit.